There was certainly a recurring theme as I prepared that ended up being a great lesson. That theme was Just Keep Going. When I went to my initial two-day workshop to prepare, the facilitator told us, “When you’re in the exam, if there’s a term you don’t know, don’t try to go back and correct it. Don’t let yourself get stuck on it. Don’t stop. Just keep going.” A few weeks later, I attended an all-day simultaneous interpreting workshop. The facilitator told us, “In the exam, don’t get tripped up on something you don’t know how to say, or when you blank on a word. Whatever you do, just keep going.” Ah-ha, maybe there was something to this Just Keep Going thing. If you’ve taken this exam, you may be nodding your head in agreement. If you’re not familiar with this test, the reason that you have to Just Keep Going is because the test just keeps going. Here’s the deal: They sit you down with headphones, and you listen to a recorded dialogue and then you begin your interpretation, which is recorded and then scored. There is no allowing for the candidate to get tripped up and tell the proctor, “Hey, can you back up the recording, I got kind of lost at that one part there.” You don’t keep going, and your score tanks. In the weeks leading up to the exam, I was preparing for at least a couple hours a day. I would come home from work (supervising health care interpreters), listen to a recorded dialogue, record myself doing the simultaneous interpretation, and then listen to my recording and compare it with the transcript of the dialogue. After noting my errors, I would go back and interpret the same dialogue. And then I would go back again and note my errors. Over and over again. Sound tedious? I loved it. Yeah, it was a big time commitment and it intruded a teensy bit on my social life, but I loved it all the same. I was amazed at how quickly I improved. I am amazed at what we can train our brains to do. My interpreting practice was so engaging, I thought, “I need more of this in my life.” I felt like my brain was sparkling. The night before my exam, at the recommendation of my “coach”, I didn’t do any interpreting practice. When I went in for the exam the next day, I felt relaxed. During the exam, while I was interpreting, I felt clear-headed and intensely focused. I stumbled a couple of times, but I never stopped. It’s a quick test, which adds to the pressure. I perform pretty well under pressure. But as soon as it was over, I felt shaky and my heart was racing. Afterwards, I thought a lot about the things I did right. I was expecting a good score, and two weeks later when my results came in the mail, delivered in a big envelope (not a little one), I knew. I grabbed the big envelope from my mailbox and held it for a few moments before opening it to read the letter congratulating me on passing the exam. As much as I disliked the idea of writing a follow-up tail-between-my-legs post about failing the exam, I don’t think this was in any way the motivation behind my preparation. I think my efforts were driven by something deeper. There is just something about interpreting. It’s like, my “thing”, you know? If you have a “thing”, I know you know. This is only the first step on this path for me. Passing a test is one thing. Performing on the job is another. It is at once thrilling and bittersweet, contemplating the possibilities for this new beginning while knowing that other parts of my professional life will then come to an end, and I will move through the challenges we all face when gracefully letting go of one thing so that we can welcome and embrace something new. There have been so many lessons learned already; some for the first time, and others are reappearing. So far, my favorite lesson from this new journey is Just Keep Going. It’s not always (or ever?) going to be flawless. Sometimes you’ll stumble. There will always be something you don’t know, something new to learn. Sometimes you’ll get knocked down. So, get knocked down. Rally. Catch your breath. Get back up. Come out swinging. Just Keep Going. Thank you so much for sharing this. I am a Korean medical interpreter and planning to take NY court interpreter test in June. 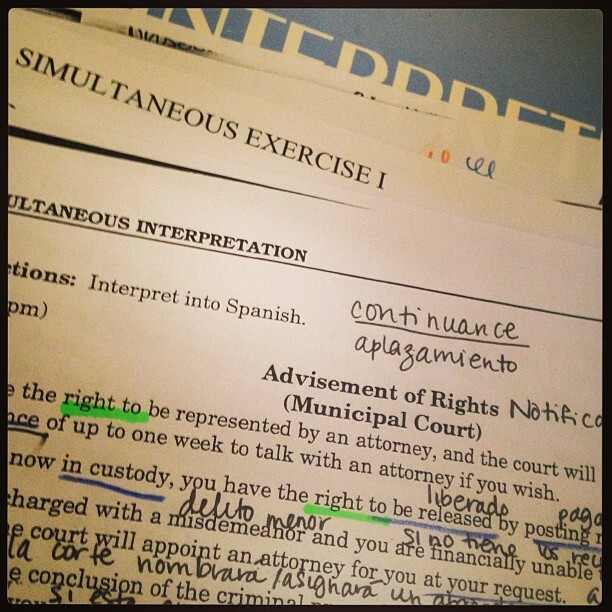 I haven’t figured out how to study to prepare for court interpreter exam. Do you have any resources or classes i should consider? Look forward to hearing from you. In addition, I found some practice resources for Korean on the Acebo website: http://www.acebo.com/products/the-interpreters-edge-generic-edition-with-the-korean-cd-set. This will help you prep for working in court, but not necessarily for the written exam. I’m not sure how your state test is run, so your best bet to get further advice is to search for your local interpreter association. The members should be able to give you some more guidance. Good luck! Hello, I happened to run into this page doing a simple “how to pass interpreter exams”. Ive been working for a debt attorney for 4 years translating for clients so I have a lot of experience when it comes to quickly and efficiently making sure both parties understand what they’re saying to one another. I have noticed the vocabulary is a lot larger but im not to worried. My questions is simple, do i go to a class/school to assure ill pass or will home/book studies be enough to pass? Hi Ralph, Great question! Here in my state of Indiana, we are required to attend a two-day workshop before each phase of the court exam. Even if it weren’t required, I would recommend attending a class if that’s available to you. Keep in mind that you start court interpreter certification with a written exam, which is going to ask you a broad range of questions about all things legal. Even if you feel comfortable with this kind of content, if you’re going to invest in time and money to take a test, why not take that extra step to take a class and make sure you’re prepared? Even if the class is all review to you (though you will most likely learn something new), you will have the benefit of an instructor’s feedback and guidance on how to prepare, and if it’s an onsite classroom, you’ll have the benefit of reviewing material while you interact with other interpreters. I had my training with Augustin de la Mora, who offers court interpreter test prep online and onsite. Their website is interpreter-training.com. The University of Arizona’s National Center for Interpretation also offers prep courses and materials. After you pass the written exam, you’ll want to get materials to prep for the oral exam. I (and many other interpreters) used the materials from Acebo.com, which is what we used in my grad school courses as well. You’ll want to look at the exam content on the NCSC website: http://www.ncsc.org/Services-and-Experts/Areas-of-expertise/Language-access/Written-and-Oral-Exam-Resources.aspxKeep in mind also that interpreting in “real life” and interpreting for a test are different–you will definitely want to think about how you’ll want to prepare for the oral exam when the time comes. Good luck!